Venezuelan President Nicolás Maduro has said he would allow US FBI agents into the country to help investigate the alleged assassination attempt against him a week ago. The US has indicated it will co-operate with investigations, but it has not made a known offer for an FBI visit. The Venezuelan leader regularly accuses the US of wanting to overthrow him. The two countries have long had a tense relationship. When Mr Maduro was re-elected in May, the US increased its sanctions on Venezuela, saying the vote had not been free or fair. 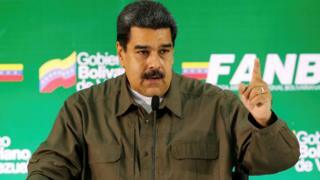 However, in a televised address late on Saturday, President Maduro surprised many by saying he would accept US help to investigate the alleged plot. “If the US government offered, or confirmed its offer, of FBI co-operation to investigate, I would accept it,” he said. Mr Maduro said there were “terrorist” cells in Florida, which had masterminded the plan and needed to be dismantled. He also called on the Peruvian government to extradite suspects living there. What happened in the alleged attack? The incident happened when Mr Maduro was speaking at military parade on 4 August. 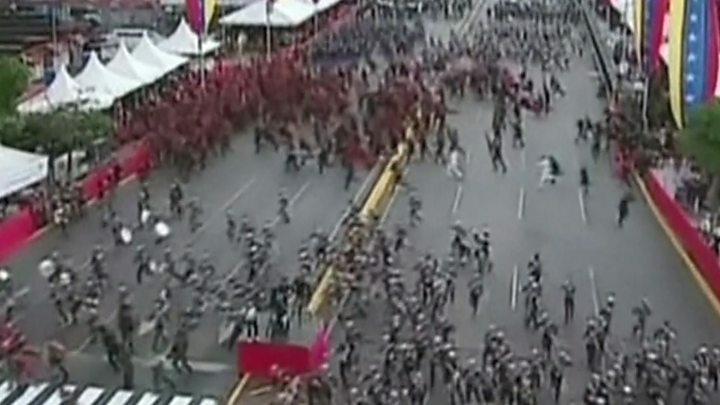 Video footage showed the startled president looking upwards as loud explosions went off, and dozens of soldiers disbanding their formations to run away. Communications Minister Jorge Rodriguez later said that two drones loaded with explosives had gone off near the president’s stand. The president was unharmed, but seven soldiers were injured. How could the US help? The Venezuelan government wants to secure the extradition of its primary suspect, Osman Delgado Tabosky, who lives in Miami, Florida. Foreign Minister Jorge Arreaza met the top US diplomat in Caracas James Story last week, and requested assistance. Mr Arreaza said the US had agreed to co-operate. US National Security Adviser John Bolton has denied any US involvement in the alleged plot. “If the government of Venezuela has hard information that they want to present to us that would show a potential violation of US criminal law, we’ll take a serious look at it,” Mr Bolton told Fox News last Monday. Who else does Mr Maduro blame? Mr Maduro has repeatedly said he thinks former Colombian President Juan Manuel Santos ordered his murder, via contacts in the Venezuelan opposition. The socialist leader believes it was “a right-wing plot” to assassinate him. The Colombian government called the accusations absurd and baseless. Mr Maduro has also accused the former speaker of Venezuela’s National Assembly, Julio Borges, of co-ordinating the attack, and an opposition lawmaker, Juan Requesens, is among several people detained in the aftermath.